I have no idea why, but lately I've been obsessed with the idea of cooking brunch. Perhaps it's the prospect of alcohol before midday! (Mimosas are basically fruit; perfectly acceptable for breakfast). Fluffy fried carbs! So much bacon! All of the above? Whatever the reason, I've found myself pinning Breakfast and Brunch Party Ideas on Pinterest, and voraciously reading pancake, waffle and French toast recipes. (Have we all got The Food Lab? Are you as impressed with it as I am? I want to make ALL the egg, waffle and pancake recipes!) Recently I also got my copy of Joy the Baker's new book, the brunch-themed Over Easy, so the brunch-obsession shows no sign of abating. 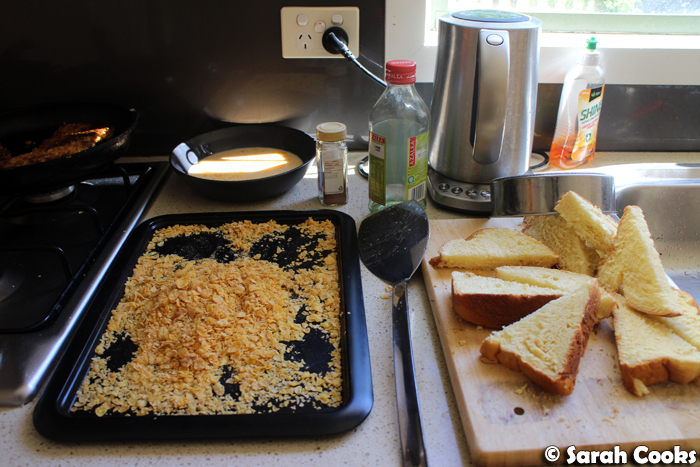 Last month, we went on a weekend away to the Dandenongs with our buddies Jenni and Jimbo ("Jenbo" is the accepted portmanteau), and I thought this would be the perfect excuse to whip out a fun brunch recipe - cornflake-crusted French toast! I had a vague recollection of my friend Clarice enthusiastically telling me about cornflake crusted French toast some years ago, and since then it had been on my mental to-do list. I suggested this to Jimbo prior to our weekend away, and he was super keen! Woohoo. Decision made. So, some googling revealed to me that cornflake-crusted French toast is definitely a Thing, an American Thing, and there are many different recipes for it all over the internets. 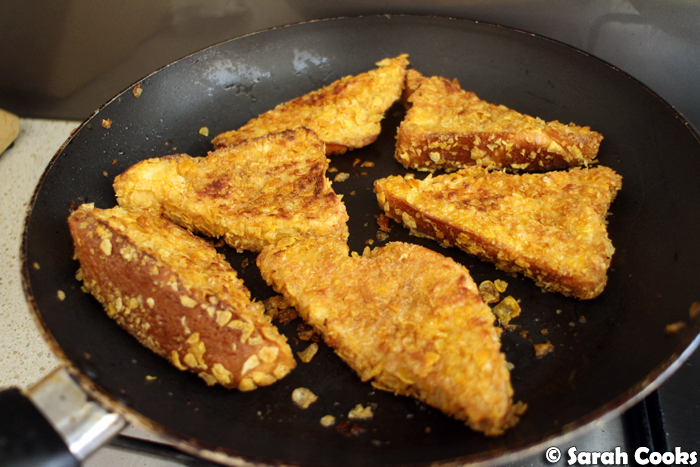 Basically you dip French toast into crushed cornflakes before you fry them. I just winged it, using some tips I've gleaned over the years to make the French toast extra special. We're talking brioche, for a touch of sweetness and extra rich buttery goodness. I sliced a loaf and left it out to stale overnight. This helps it absorb the eggy mixture without disintegrating. There's vanilla in the egg mixture (thanks Nigella for this tip), and I also sprinkled cinnamon into the crushed cornflakes - such easy, small additions, but so fragrant and comforting. We're also frying in butter, with a tiny drop of oil to prevent it from burning - another Nigella tip. (I forgot to bring butter with me - thanks Jenni for driving out early in the morning to get it! And extra thanks for splashing out on the fancy butter). I set up a little assembly line next to the stove - dipping the brioche in the vanilla-eggy mixture, then the crumbs, then into the hot pan. And as I did this, I realised that I was basically making little breakfast schnitzels. Could this recipe be any more perfect for me? Hot tip: have one "wet" hand and one "dry" hand, to prevent you from getting schnitzel fingers. Then it was time to eat! 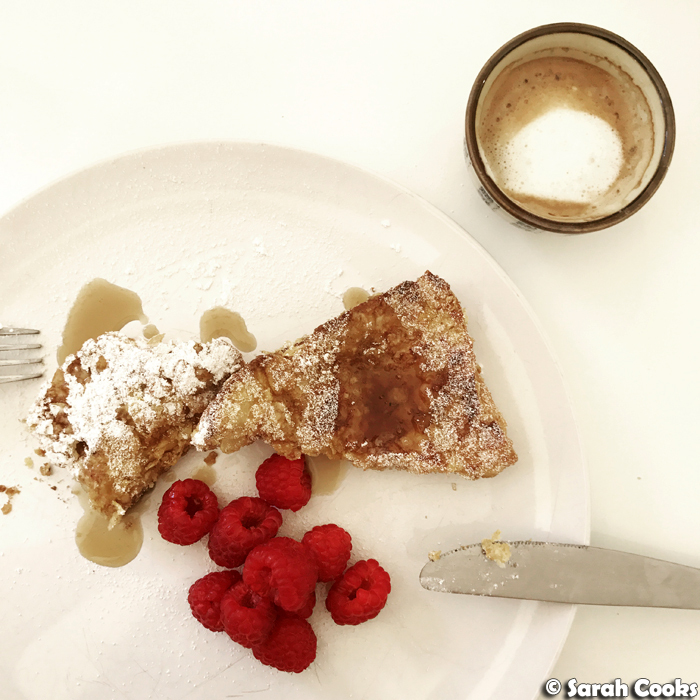 With maple syrup, hot coffee, fresh raspberries and a generous dusting of icing sugar. The Air B&B we were staying in had a pretty cake stand in the cupboard, so I served the French toast on that. Extra fancy! This French toast is next level delicious - it's all custardy and soft on the inside, with a fab buttery crunchy crust. Like having dessert at breakfast! If you wanted to really gild the lily, you could serve it with whipped cream, mascarpone, or ice-cream, but I think it's just perfect as it is. 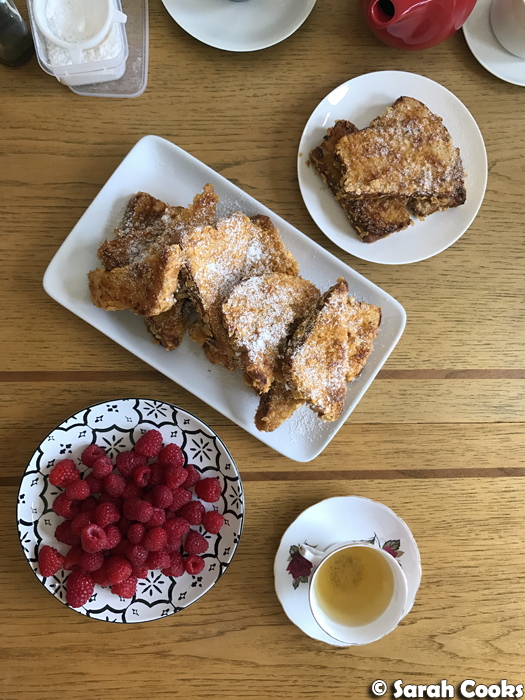 The next weekend, Easter weekend, we went away again to a friend's holiday house, and I couldn't resist making the French toast again! One of our friends who came has a gluten intolerance and she didn't want to miss out, and she actually made her own gluten free brioche for the breakfast. (Next level ninja skills). Genuinely considering keeping brioche in the freezer and cornflakes on standby just so I can make this All The Time. Slice the brioche into thick slices (approx. 2.5 cm / 1 inch), and slice diagonally into triangles. Lay the pieces out on a chopping board and allow to stale overnight. When you're ready to eat, preheat the oven to 100C. Whisk together the eggs, milk and vanilla extract. 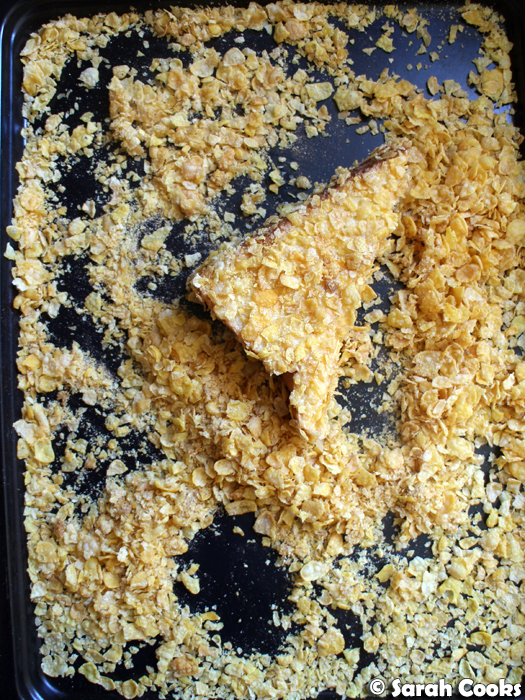 Crush the cornflakes and spread out in a shallow tray. Shake the cinnamon over and stir to combine. Melt a little butter in a large non-stick frying pan over a low heat and add a drop of oil (to prevent the butter from burning). 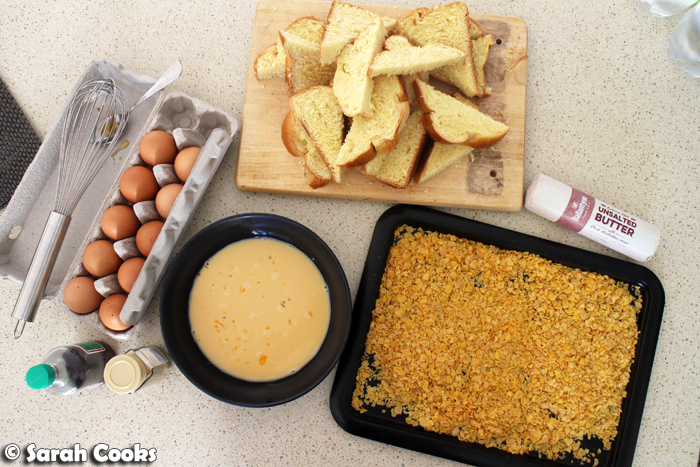 Dip each brioche triangle in the egg mixture on each side, followed by the cornflake crumbs. 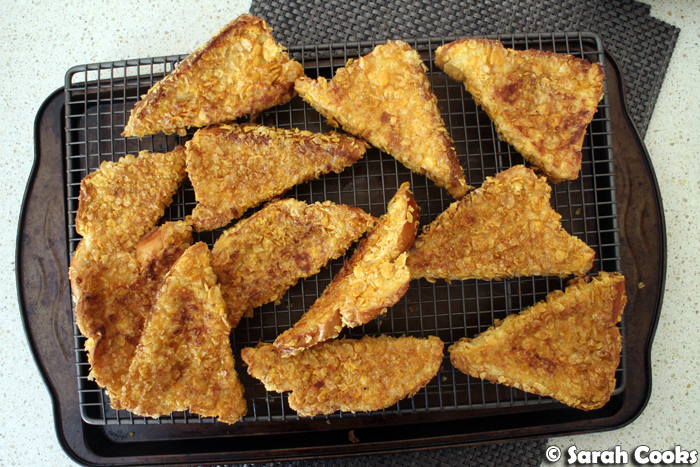 Fry the crumbed brioche pieces on each side until lightly golden brown and cooked through. Place the cooked pieces on a tray in the oven while you cook the rest of the French toast. 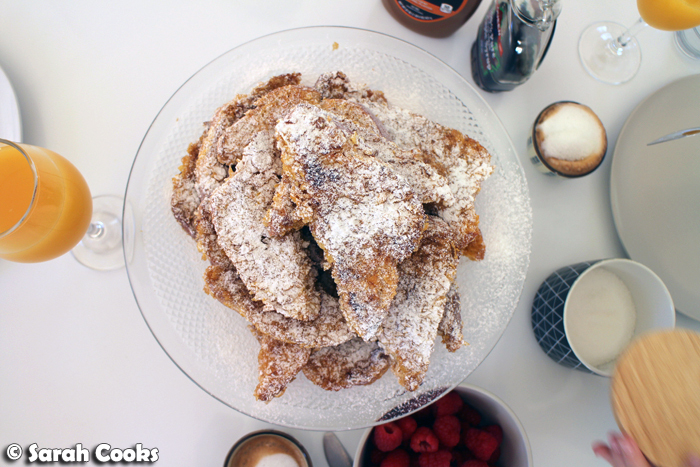 Serve dusted with icing sugar and drizzled with maple syrup. 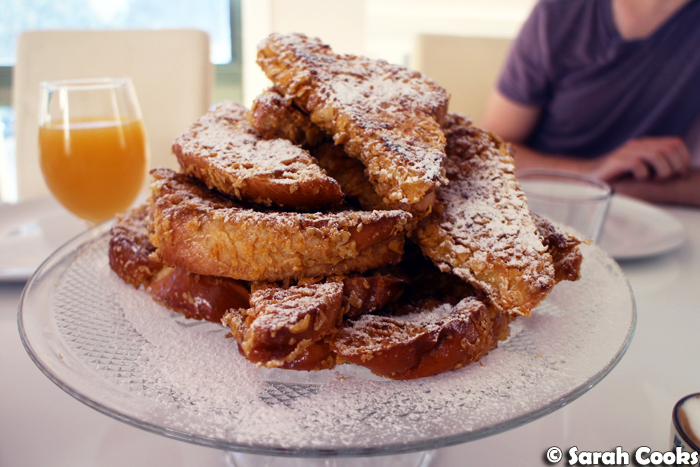 Um cornflake-crusted French toast? Genius!!!!! And love that you even kept the early batches warm in the oven. Yay! It's all about ensuring consistency for everyone at the table - don't want people snaffling the fresh ones out of the pan!